Source: Greenwich Graphic. Saturday, May 13, 1899. Page 1. The Inside of it is Antique. Indeed. Everybody about the village was recognize this picture. It's an old house on Lafayette Place and it sits perched up on a bank as though it was not "part or parcel" of the houses surrounding it, and neither is it. It has so much in contract with its neighbors, that it is the most conspicuous building on this short street. "When was it built?" That is hard to say. Some who pretend to know will tell you that it was put up in 1650. Its appearance indicates that it is at least two hundred years old. Look at the old shingles, the hand-wrought nails sticking out here and there, and the big stone chimney, and the general dilapidated appearance of it-although that is not always a sign of age, but in this case it is easy to see that it is very old. 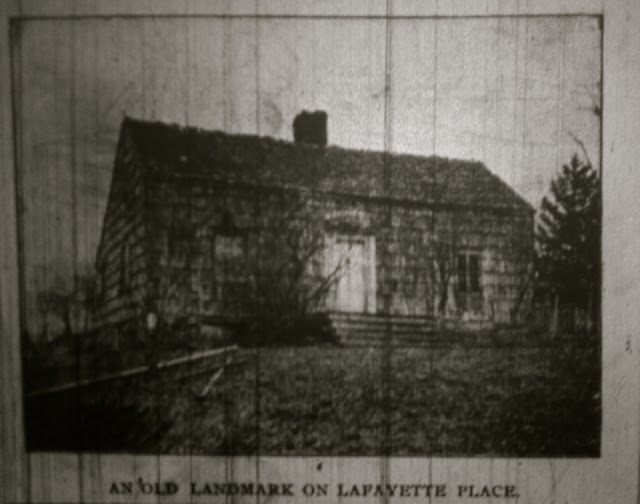 Lafayette Place was but a cow-path when its timbers were first put there, and there was no other building between it, and the Sound, and the view in those days from its doorstep must have been fine, indeed. This property was owned way back in 1725 by John Hobby, who sold it to Nathaniel Mead. It was known as one time as the Dunton Homestead, where lived Royal Dunton and his family. Its size and shape is different from the houses that were built during the Revolutionary War. It's a very old settler and was famous years ago. Mrs. Mary Thompson, whose maiden name was Banks, with whom we talked about the old house, said that her grandmother and her mother and she were all born there, and the house was very old in those days. She thinks it is about 250 years old. But it can't be quite as ancient as that, for Greenwich was settled in 1645, but this was probably one of the first houses erected. Mr. Joseph E. Russell considers it one of the oldest houses in town. When he was a boy it looked as aged as it does now. 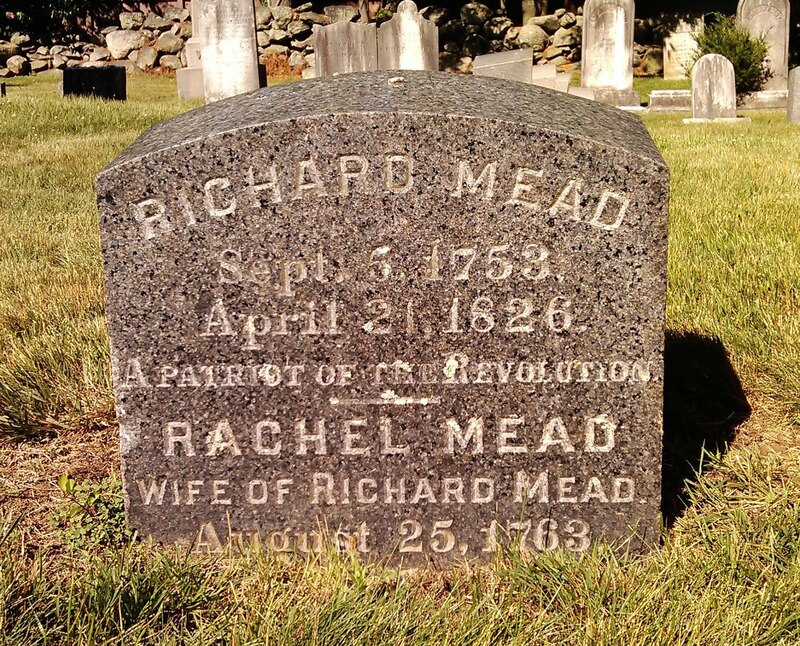 When Nathaniel Mead occupied it, which was during the Revolutionary War, Cowboys and the British made raids upon his herd of cattle, and he always kept his musket handy night and day. In the field and by his bedside it was his constant companion. We can well imagine what a beautiful farm it must have been in those days, the lay of the land must have been ideal. 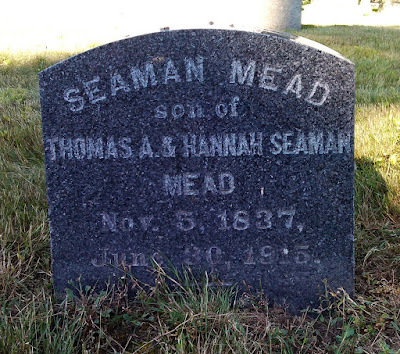 They tell funny stories of one Thomas Mead, who was known as the fat fiddler, who lived there. He weighed, it is said, 400 pounds. He disliked to walk any distance, and when they wanted him to play, they would back a cart with oxen up to the door and he would get in and off they would go, carrying him to the place where his fiddle and bow were wanted. He was exceedingly popular with the young people, and his presence was always necessary for a merry evening. It is said, too, that notwithstanding his great weight, and disinclination to walk, he was a graceful dancer and was light on his feet when whirling a Colonial girl over the floor. Mr. Mead lived in this house for many years and when he died the door sash had to be removed to allow the coffin to pass out. Some years ago the house was purchased by Augustus Lyon. At one time Azra Banks resided there and worked in a little shop near the house as shoe maker but this small building disappeared. It is said that an English officer who had been wounded was taken to the house and died in the South room. But if you want to judge the house and its age, go inside and see that long, wide room on the first floor, which is almost the same as when around the big fireplace the family and neighbors gathered 150 or more years ago. The ceiling is so low that a man of six feet must stoop to walk about. The quaint doors hang on the same hinges, and the little iron latches appear to have been made at a time the house was erected. There is, perhaps, no house in Greenwich that would more impress you with its age, than this one, after you had taken a look at the inside of it. It is going to pieces rapidly, and can't last but a few years more as it now stands. It is owned by Mrs. Francis Warburton. Richard Mead, "A Patriot of the Revolution"
There is an old saw that lightning rarely strikes twice in the same place. But this isn't true in Greenwich. Down in the valley at the rear of Mr. Seamen Mead's residence there is something that attracts lightning. In fact that locality seems to have, more or less, a something that draws electricity in a thunderstorm. Mr. John Dayton's, Town Clerk Mead's, Mr. Chas. Cameron's and Mr. George Rowland's residences on the Field Point Road and near by have all felt the bolt. Now they are all protected by lightning rods, and thunder storms pass them by without harm. Three barnes has been struck by lightning near where the one which was destroyed in Sunday night's storm was located. In 1876, in 1896 and in 1899. The one burned in 1876 belonged to Col. Thomas A. Mead, and the other two to Seaman Mead. A terrific thunder storm passed over Greenwich Sunday night, the air had been heavy all day, and the conditions were just right for a severe electrical storm. It was one of the most severe storms of the summer. There was a continuous play of lightning for some two hours before the rain came, and then the dark clouds poured their contents to the earth, the wind blew and the lightning and thunder was something awful, it being incessant. 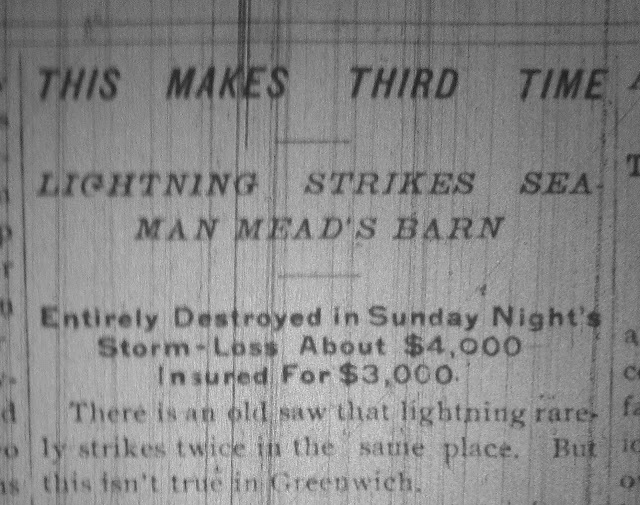 About nine o'clock it became known that Seaman Mead's barn had been struck by lightning and was in flames. The fire alarm had made known that there was trouble, but didn't tell where, for it struck one, but the glare in the west told where the fire was. In the pouring rain, with the lightning flashes coming in frightful succession and brilliancy, with the thunder roaring incessantly, the firemen responded to the call. So on the Volunteers and Amogerones were on the spot and had two or three streams of water playing on the fire. It was seen that the barn could not be saved, ___ the fire was well underway before the firemen arrived. And so efforts ____ade to save the barns and houses near by ___anger, which were successful, for the flames were kept confined to the barn which was struck. In charge of the firemen was Chief Engineer Russell, with Foreman Mead, Assistant Foreman Peck of the Amogerones, and Assistant Forman Emery and Mahoney of the Volunteers. next to the Second Congregational Church, Greenwich. 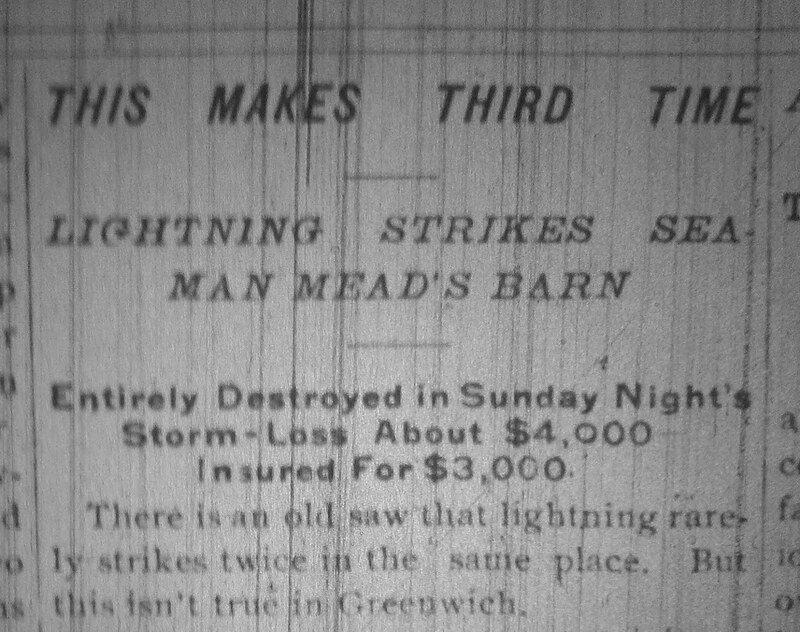 Mr. Mead and his family were sitting on the piazza of their house when the lightning struck the barn. An alarm was rung in from the box near the old toll gate, but it was thought that the storm had affected the wires in some way, and the system failed to work. When they heard the crash they surmised that the barn had been struck, and on going to look in that direction they saw that it was on fire. The family rushed to save the horses, there being three in the barn, and succeeded in getting them out of the barn, and also in saving, with the help of neighbors, the carriages, harness, and other things in the barn. Miss Louise Mead, who had pluckily gone into the barn, and had succeeded in finding one of the horses, was injured by being thrown to the floor by the fright of the horse. She had grasped him by the mane, and was leading him out, when he became frightened and, throwing his head, freed himself from her grasp, and with such force as to cause her to lose her balance and she fell heavily to the floor, badly bruising her shoulder. At two o'clock the firemen went home, all danger being over. The barn was insured for $3,000 by Mr. Cameron, the insurance agent. The claim was promptly adjusted and the companies are ready to pay Mr. Mead. It will cost about $4,000 to replace the barn for the building was a large one.